ACLD’s School Vacation Respite Program, an OPWDD-funded service, offers 12 children, aged 5 to 12 a place to gather with friends and staff during school vacation breaks and participate in programs designed to foster their sense of self and social development. Participants must have a documented developmental disability, reside at home with a primary caregiver, and meet OPWDD eligibility requirements. School Vacation Camps run during winter break (February) and spring break (April) in collaboration with our community partners, The Great South Bay Y in Bay Shore from 9 am to 4 pm, or the Suffolk YJCC in Commack from 9 am to 3 pm. Children are integrated in to a group of approximately 16 participants enrolled by the Ys and to the best of their abilities participate in structured recreational activities including swimming, arts and crafts, dance, cooking, gym/exercise, special events and field trips. Individuals over the age of three may have an ACLD Respite Counselor work with them in the home. Respite Counselors are hired and trained by ACLD. This program is funded by Medicaid waiver and an OPWDD grant. Children without Medicaid are funded by the grant. Children with Medicaid must enroll in Medicaid waiver. Typically, each family receiving in-home respite services is allotted 15 respite hours each month. Individuals and families in crisis may be allowed additional hours. Through an OPWDD grant, children without Medicaid may be eligible to hire their own Respite Counselor and be reimbursed up to $500 per year. 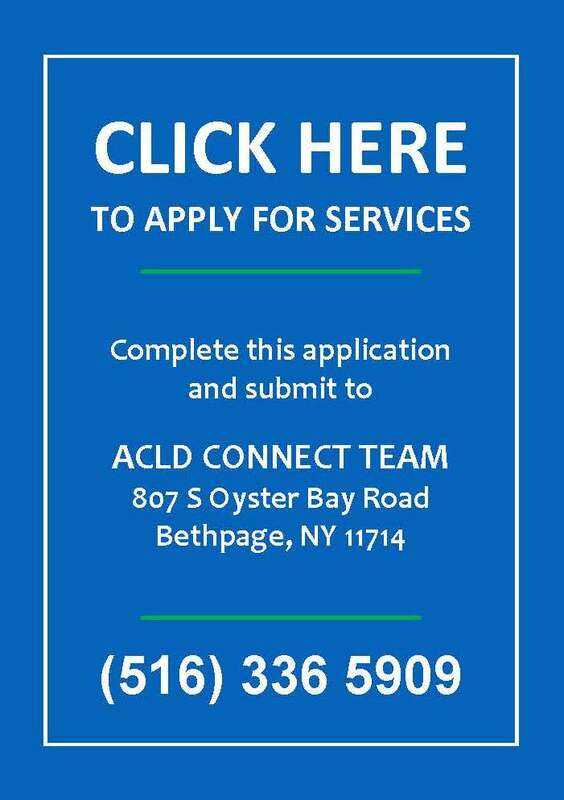 For further information, please contact ACLD’s Connect Team at (516) 336-5909 Extensions 171, 242, and 370. A program funded by OPWDD, offers children with disabilities from ages 5 through 12 positive developmental experiences by providing opportunities to develop core values, learn new skills, make new friends and have fun in the process. Campers must reside at home with a primary caregiver, have a documented disability and meet OPWDD eligibility requirements. ACLD collaborates with the Great South Bay Y in Bay Shore. Campers may choose Session 1, which takes place during the first three weeks of the Y Summer Camp or Session 2, which occurs during the following three-week period. Our camp provides a positive and exciting experience in a safe and accepting environment with programs designed to enhance campers’ self-confidence, self-esteem and cooperation skills. Children are integrated into a group of approximately16 other campers enrolled by the Y, and to the best of their abilities participate in structured recreational activities including swimming, arts and crafts, dance, cooking, gym/exercise, special events and field trips between the hours of 9am and 4pm. ACLD will provide staff (with a 2:1 child to staff ratio) with rigorous training in working with children with special needs. Campers should be able to work in a large integrated community group setting and be able to successfully transition between activities and schedule changes. Campers are expected to attend all days during the three-week program. Campers should be toilet trained or be able to use the bathroom on a schedule. Transportation is not provided and parents/caregivers are expected to drop off and pick up the children daily. Campers must bring their own lunch. There is a requested participation fee (determined yearly) to help defray the cost of operation and special events; however, as an OPWDD-funded program, campers will not be denied services due to the inability to pay. For more information, please call (631) 647-9577 Ext. 232. ACLD’s After-School Therapeutic Recreation Program provides recreation opportunities to improve the health and well-being of school-age children, ages 5-21, with disabilities. Many times children with disabilities do not have the opportunity to participate in their home school districts’ recreation programs or after-school activities due to their disabilities. This may leave children with developmental disabilities no options for after-school activities. Our program is designed to fill their social and recreational needs. Students have the opportunity to choose to participate in a variety of activities on a daily basis including arts and crafts, music, games, toys, puzzles, sports, cooking, outside play and special events. The After-School Therapeutic Recreation Program hours of operation are Monday through Friday, 2:15 pm to 5:45 pm. The program follows the Bay Shore public school district calendar. (MSC) assists people with documented developmental disabilities in accessing and coordinating services. This service is available to those who are Medicaid eligible and who can be approved for services through the Office for People With Developmental Disabilities (OPWDD). Is provided through a Family Support Services grant and is available to those who are not Medicaid-eligible but who require assistance in accessing necessary services. This is a grant program designed to provide information and referrals, life planning assistance and transitional planning awareness to individuals and their families. This program also gives information and referrals to local schools, hospitals and other agencies.